If you’re going to be in your kitchen 12 times a day, Make sure you like the way it looks and feels. 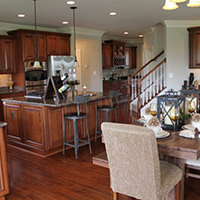 June 14 – Everybody agrees the kitchen is the most popular room in any home. In fact, we enter and exit the kitchen an average of 12 times per day on weekends, according to website sheknows.com. So CarrHomes devotes more time planning and designing our chefs’ kitchens to satisfy, not just the needs, but the desires, of our homeowners. Take this kitchen in the Lancaster, our new model home now open at our Waterford Creek community in Hamilton, Virginia. It is a classic example that commands your attention with its high ceilings and included hardwood floors. 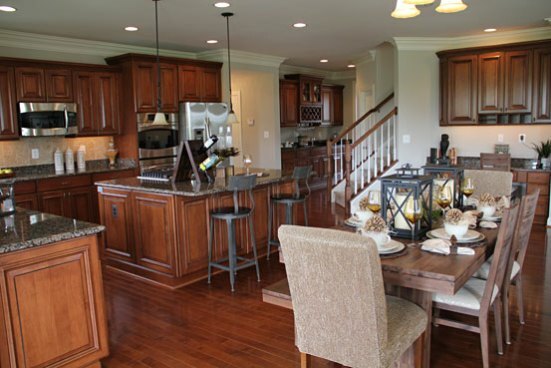 The open corner design with granite-topped cooktop island is more than just attractive and inviting. It creates an efficient triangular working environment focused around the cooktop. The stainless steel refrigerator and wall oven are at one corner. The double bowl sink and built-in dishwasher are at the other corner. Every appliance is literally just a step or two away from the cooktop. Natural light brightens the kitchen from both the rear and the side of this home. And since kitchen storage space is on the top of everyone’s wish list, our kitchens feature custom-quality and an abundance of custom-sized 42″ wood cabinets. But to really appreciate this and all our CarrHomes‘ kitchens, step inside any one, at any of our northern Virginia communities. We’re certain you’ll see and feel the difference.